Saturday July 4 1908 I put in the whole day sweeping cleaning and doing baking till four oclock. I then took a bath and dressed to go down to Otts to picnic supper Will came later for the fire works. We came home at 9.39. Billy was away all day. Weather fine. Sunday July 5 1908 I got my work done up and drove down to church Ida and I went tothe Baptist church. I got the dinner after I came home. We slept in afternoon Clara & Nellie came out. Nellie stayed all night. 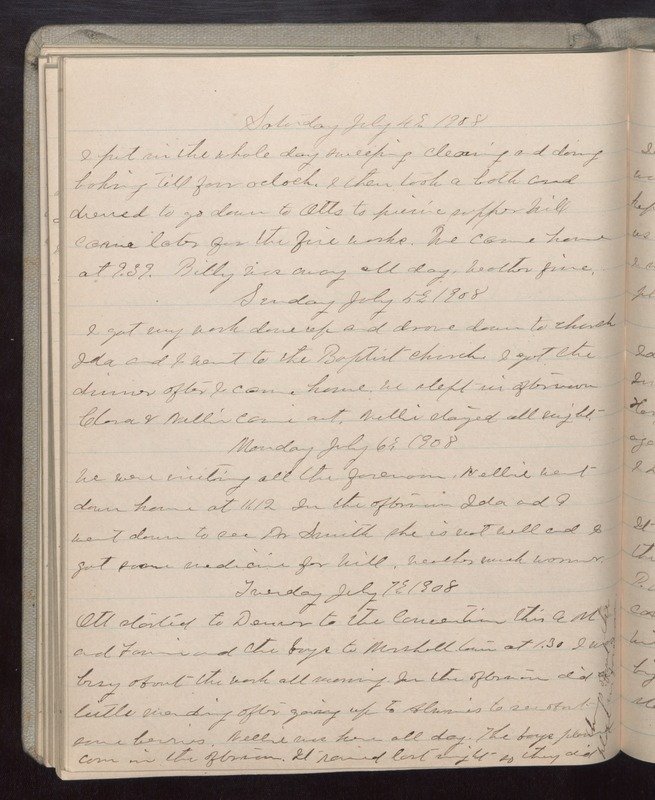 Monday July 6 1908 We were visiting all the forenoon. Nellie went down home at 11.12 In the afternoon Ida and I went down to see Dr Smith she is not well and I got some medicine for Will. Weather much warmer. Tuesday July 7 1908 Ott started to Denver to the convention this AM and Fannie and the boys to Marshalltown at 1.30 I was busy about the work all morning. In the afternoon did a little mending after going up to [illegible] to see about some berries. Nellie was here all day. The boys plowed corn in the afternoon. It rained last night so the did thing about the place in forenoon.